In this Jupyter Notebook we will retrieve data from the European Central Bank (ECB). The ECB publishes through the European Open Data Portal, which we discussed in the previous tutorial. Before diving into the code, please take a quick look at the following websites, to get a feel for what we will be dealing with. 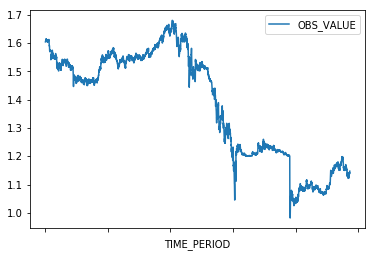 In this tutorial we will specifically take a look at foreign exchange (FX) rates, using Python 3. As always, let's start with importing some packages we will use for this exercise. In this notebook, we will retrieve the Euro / Swiss Francs (EURCHF) exchange rate time series from the year 2000 until today. To retrieve the data, we need to construct an URL which we can use in a HTTP request. Fortunately, this is pretty simple. For this example we only use two parameters, startPerdiod and endPeriod, but you can add more if you like. The request/response has been successful. If you click on this link, it will download the data as a file. It doesn't have a useful extension, but you can open it as a text file if you would like to inspect its contents. But of course, we can do this in Python too without leaving this notebook. Let's take a sneak peek at the data we received. Hmmm, the response is in XML. Not impossible, but also not the easiest format to work within Pandas. Fortunately, the ECB's API lets us get the data in CSV format by specifying it in the header of the request. Excellent! Now we only need to load this response in a Pandas DataFrame. We can use 'StringIO' to read the strings as a file. This way we don't need to save it first and we can use it directly. You can see there are 4858 rows, which makes sense for almost 19 years of daily prices. There are 32 columns, which is probably more than we need. We can inspect the DataFrame to see which columns we need. The columns we need are 'TIME_PERIOD' for the dates and 'OBS_VALUE' for the prices. 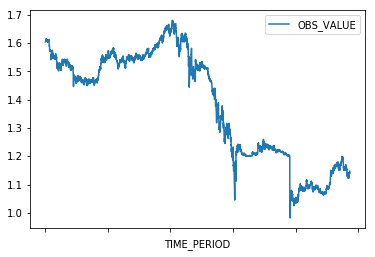 Let's also do a sanity check on the prices in 'OBS_VALUE'. # Inspect the prices. Do the mean, minimum and maximum make sense? 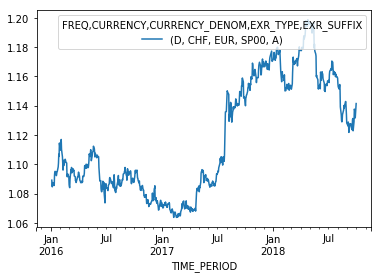 Now we will make a new DataFrame called 'ts' (for time series) with just the dates and EURCHF prices. Very often, there are already convenient Python packages available on the internet you can use. For instance, if you search the internet for "Python ECB SDMX" you will undoubtly find the 'pandaSDMX' package. It is, as they call it, a "Python client to retrieve and acquire statistical data and metadata disseminated in SDMX 2.1, an ISO-standard widely used by institutions such as statistics offices, central banks, and international organisations." Now let's get the data! As you can see, the pandaSDMX pacakage is another easy way to retrieve the same data. Hopefully these examples will help you get started. Thanks for reading!